The Duwamish River is actually the Green-Duwamish River, one of the most complex watershed systems in the country. Its headwaters start in pristine forests in the shadow of Mt Rainier which are cared for by the US Forest Service. The river, as it winds down the mountain travels through forests, agricultural land, residential areas, towns, light commercial industry and ending in the lower portion with heavy industry. As it proceeds to its mouth at Elliot Bay, it collects water from various tributaries and storm drains from the towns and cities which make up the Green-Duwamish Watershed. Much of this drainage has contributed to the significant pollution problems facing the river and its tributaries as they carry various chemicals into the river system. 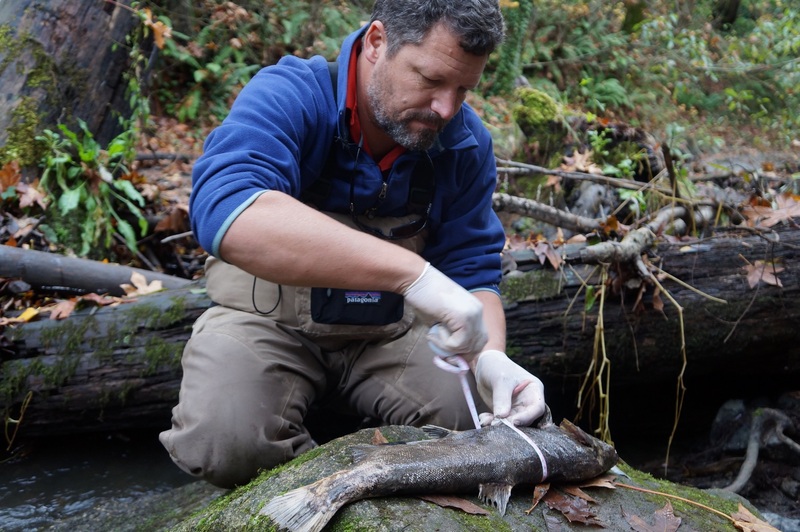 Our many partners who work to improve the health of the river through habitat restoration, working to improve water quality and education within the watershed. 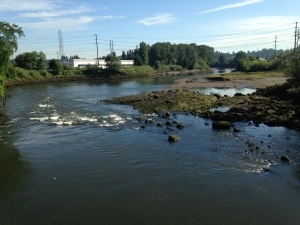 Until 1906, the White and Green Rivers combined at Auburn, and joined the Black River at Tukwila to form the Duwamish. In 1906, however, the White River changed course following a major flood and emptied into the Puyallup River as it does today. The lower portion of the historic White River—from the historic confluence of the White and Green Rivers to the conjunction with the Black River—is now considered part of the Green River. Later, in 1911 the Cedar River was diverted to empty into Lake Washington instead of into the Black River; at that time, the lake itself still emptied into the Black River. Then, with the opening of the Lake Washington Ship Canal in 1916, the lake’s level dropped nearly nine feet and the Black River dried up. From that time forward, the point of the name change from Green to Duwamish is no longer the confluence of the Green and Black Rivers, though it has not changed location. When the first European-Americans arrived in the area in 1851, they found the Dkhw’Duw’Absh people living in more than 90 longhouses, in at least 17 villages, in modern-day Seattle and environs. Radiocarbon-dating of artifacts indicates that indigenous tribes have lived along the Duwamish since at least the Sixth Century AD. The Dkhw’Duw’Absh traditionally used the river to hunt ducks and geese, fish for salmon, cod, and halibut, harvest clams, and gather berries, camas, and other plants for food and medicinal purposes. Native villages on the Duwamish were eventually supplanted by white settlement and commercial use, and there was evidence of deliberate burning of Indian longhouses in 1893. Duwamish people continued to work a1d fish in the area, using man-made “Ballast Island” on the Seattle waterfront as a canoe haul-out and informal market,but by the early 20th Century, most remnants of traditional life along the river had disappeared. The last year-round native residents on the river – an old man named Seetoowathl, and his wife – died of starvation in their float-house on Kellogg Island in the winter of 1920. In 1895 Eugene Semple, who had earlier served as Governor of Washington Territory, outlined a plan for a series of major public works projects in the Seattle area, including the straightening and dredging of the Duwamish River, both to open up the area to commercial use and to alleviate flooding. In 1909 the City of Seattle formed the Duwamish Waterway Commission in order to sell bonds and oversee the re-channelling of the river. Work began in October, 1913, and the oxbows gradually disappeared, with a few recesses in the channel left to accommodate high water flows and turning ships. Parts of the Georgetown and South Park neighborhoods once on quiet riverbank found themselves inland; the Georgetown Steam Plant was now almost a mile from the river, and special water pumping facilities had to be installed. By 1920, 4½ miles of the Duwamish Waterway had been dredged to a depth of 50 feet, with 20 million cubic feet of mud and sand going into the expansion of Harbor Island. The shallow, meandering, nine-mile-long river became a five-mile engineered waterway capable of handling ocean-going vessels. The Duwamish basin soon became Seattle’s industrial and commercial core area. Activities included cargo handling and storage, marine construction, ship and boat manufacturing, concrete manufacturing, paper and metals fabrication, food processing, and countless other industrial operations. Boeing Plant 1 was established on the Lower Duwamish in 1916, and Boeing Plant 2, further upriver, in 1936 which built over half of the B-17s for WWII. 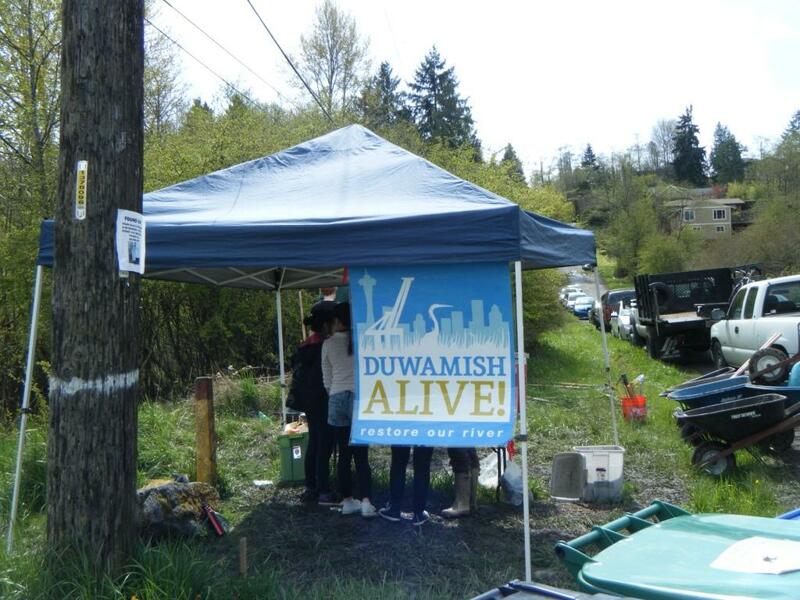 With the spread of ecological concerns in the 1970s, various environmental, tribal, and community organizations became interested in the severely polluted Duwamish. Kellogg Island, the last remnant of the original river, was declared a wildlife preserve, and nearby terminal T-107 was converted into a park, creating a substantial natural area near the mouth of the river. Cleanup and restoration efforts are ongoing. In 2009, the Duwamish Longhouse and Cultural Center was opened on the west bank of the river as part of the tribe’s reassertion of its historic rights in the area and its continuing struggle for federal recognition of tribal status. DuwamishAlive! 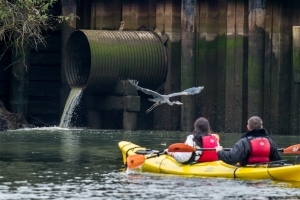 Events: On the water, volunteer in a kayak with Puget Soundkeeper and Alki Kayak Tours to remove debris from the Duwamish River Shoreline at the historic site of T107 across from the Duwamish Longhouse at 4700 West Marginal Way SW, Seattle, WA 98106. Thank you Alki Kayak Tours and Port of Seattle for their support at this site! This is a very popular activity for our events so volunteer spots are limited! Sign up today. Age minimum for kayaks is 10 years old.